It's release day at Technique Tuesday! 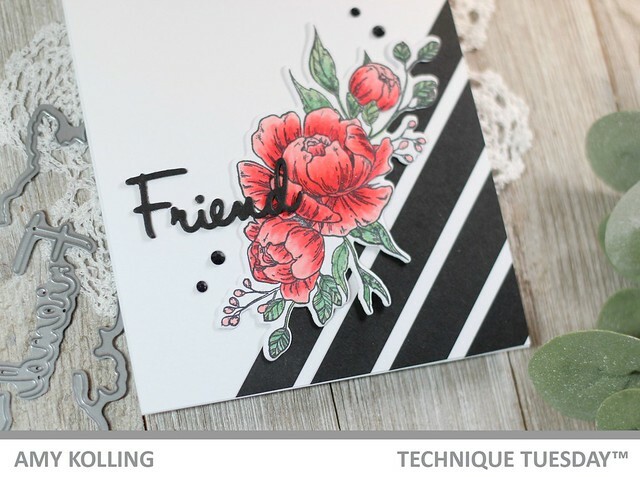 All the fun stamps and dies that have been shared over on the Technique Tuesday blog are available TODAY! I grew up loving the smell of Peonies. We had tons of them lining our fence. So I was excited to see the newest addition to the Greenhouse Society at Technique Tuesday is Fresh Peonies. I started by Copic coloring my Peony image with R20, R21, R22, R24, R27. My leaves were done using G21, G28, and G46. This is a gorgeous image and I can't wait to color it in some purples! After diecutting the images, I added it at a diagonal atop some black cardstock strips. 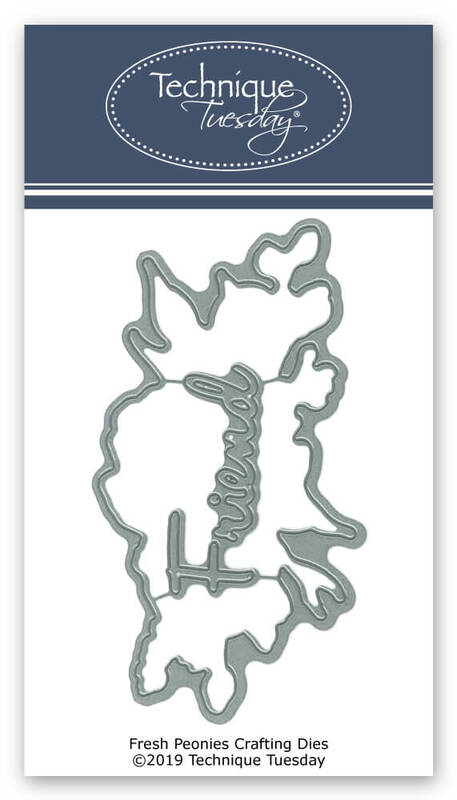 I added the die cut word 'Friend' (comes with the Fresh Peonies Dies) and some black gems. Join the Design Team for a blog hop featuring projects using the new release! 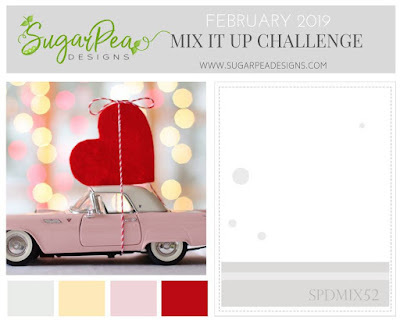 I have a card to share for this month's Mix It Up Challenge for SugarPea Designs. This inspiration photo and colors are perfect for a lovey dovey card! 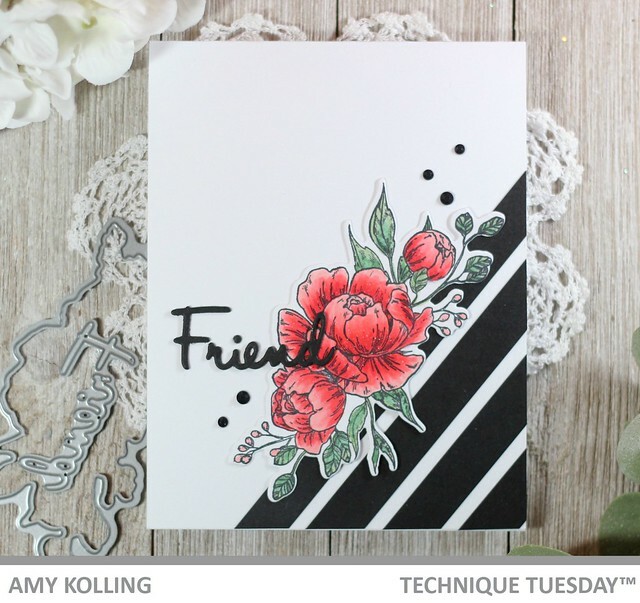 For the colors of the challenge, I pulled in some grey ink using the Cocentric Circles Stencil and die cut hearts in red, pink, and yellow using the Postage Stamp SugarCut. My stenciled panel was die cut using the scallop edge die from Card Front Element Builder. 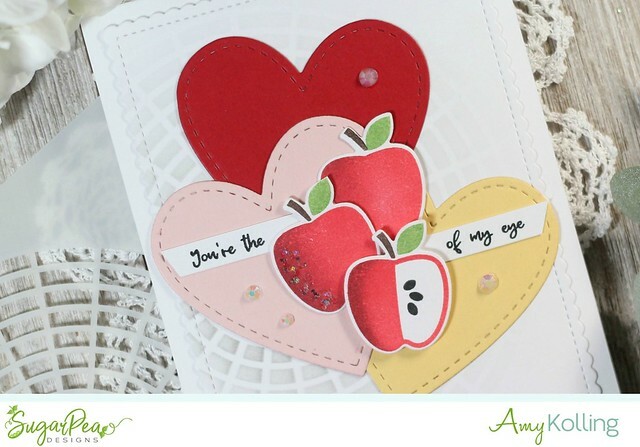 I added some stamped and die cut apples, added some chunky glitter, sentiment banners, and gems. 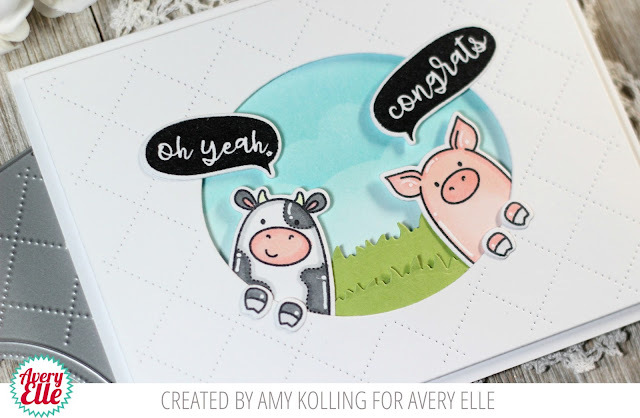 Welcome to Release Day for the Lil' Inker Designs February Release! 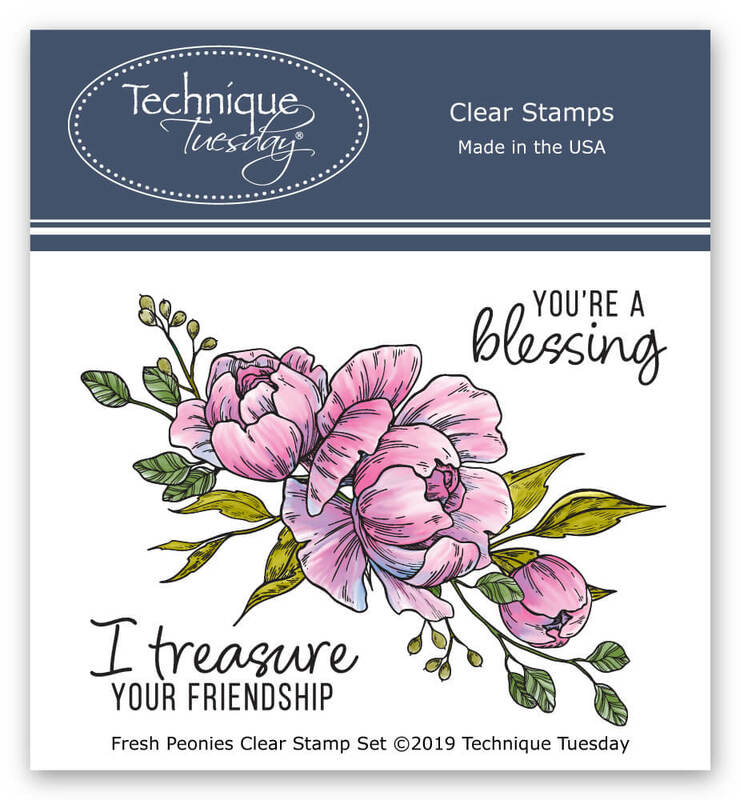 This release is FULL of amazing dies and stamps for everyday fun! Guess what?? The whole new release is now available and can be found HERE!!! Since the release of Cat Hugs was so popular.........here we have Dog Hugs! 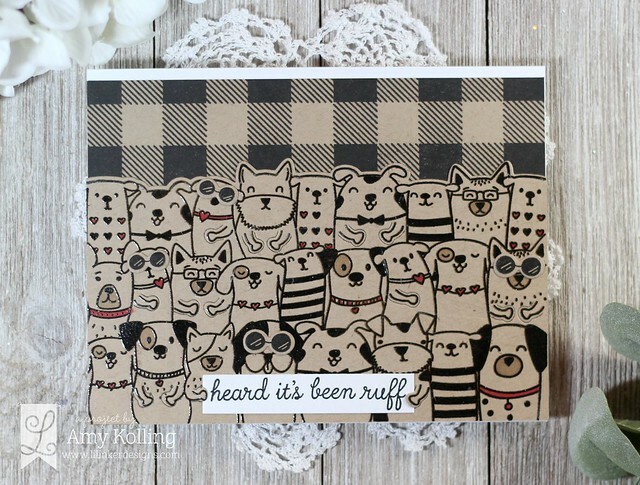 I decided I wanted all brown dogs so I black heat embossed the dogs onto kraft cardstock. I love how doing it this way allows for pops of color (in this case red) on the dogs! I added a cute little sign for the dogs to hold and mounted them onto a panel stamped with Cozy Plaid Stamps. 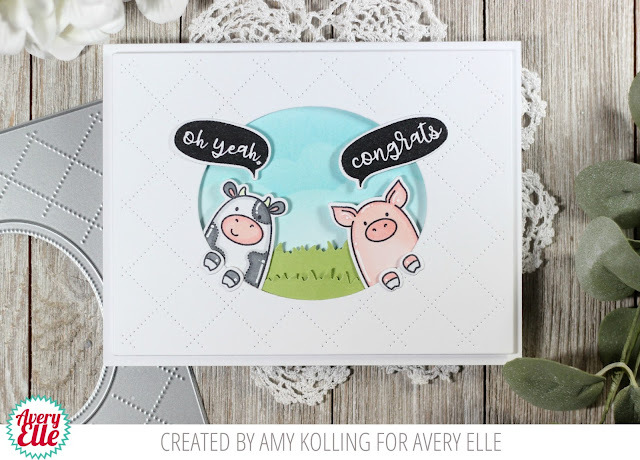 Welcome to Day 2 of the Lil' Inker Designs February Release! 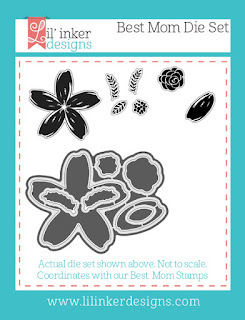 This release is FULL of amazing dies and stamps for everyday fun......are you ready? Guess what?? The whole new release is now available and can be found HERE!!! 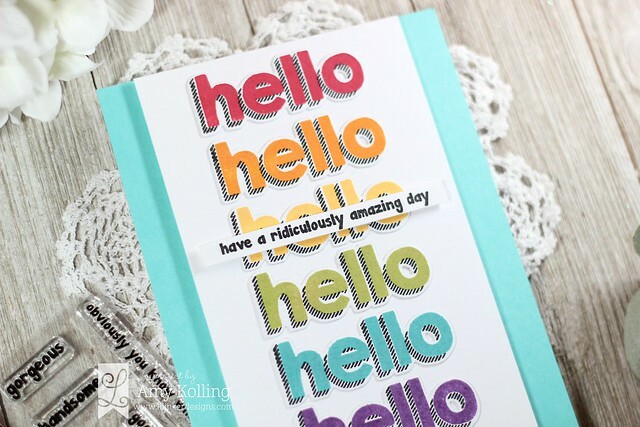 I had so much fun stamping these "hello"s in rainbow inks! 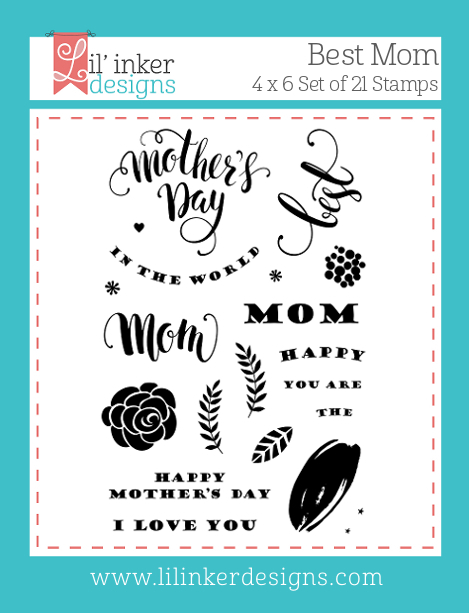 I love the shadow stamp that is included and absolutely EASY to line up! 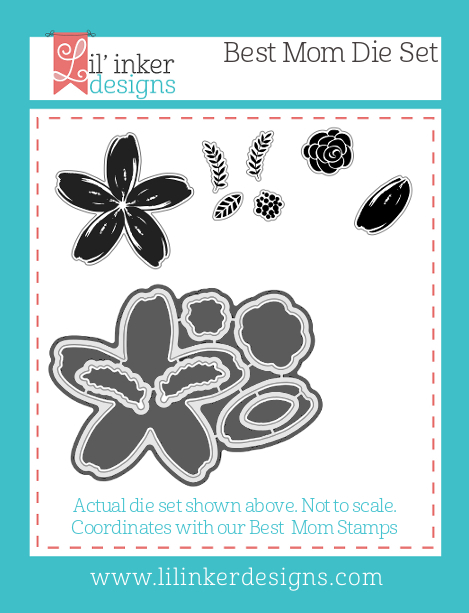 This new set is called Snarky Shadow Hello Stamp and Die Bundle. I used Lawn Fawn inks in rainbow order with black shadows. 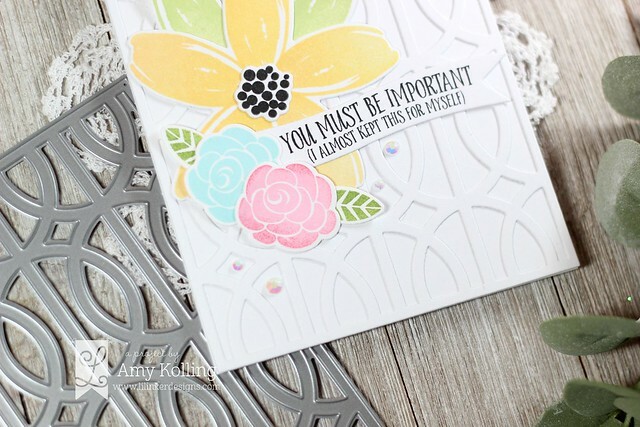 A simple thin sentiment strip was added over one of the hello sentiments with foam adhesive. There is still a HUGE SALE going on over at Lil' Inker Designs......while you shop the new release, make sure to go check out the SALE tab for some amazing products!! Lil' Inker Designs / February Release Day 1 / Giveaway / SALE! Welcome to Day 1 of the Lil' Inker Designs February Release! Starting things off with my favorite new product from this release.......Cover Up Die: Mod Circles. 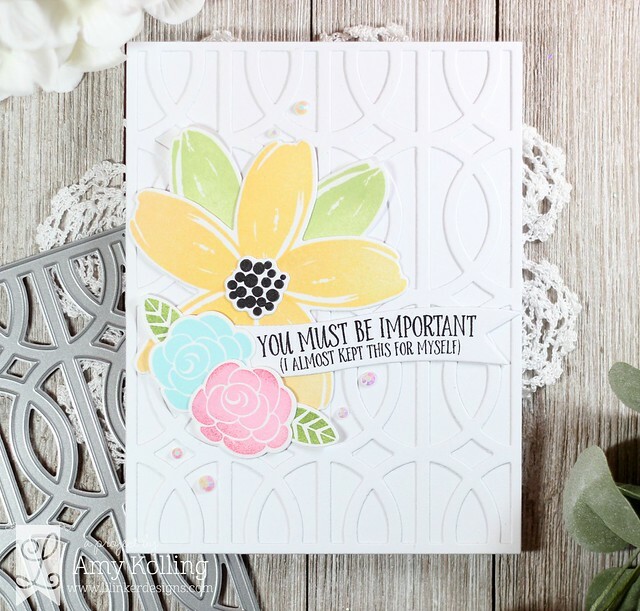 I love white on white and this new die is perfect for adding pops of color with some beautiful (previously released Best Mom) florals! My florals were all stamped with colors of Fresh Ink (these are pigment inks). I added in a simple banner that was stamped with the new Sassy Pants Stamps and some white gems from Pretty Pink Posh. 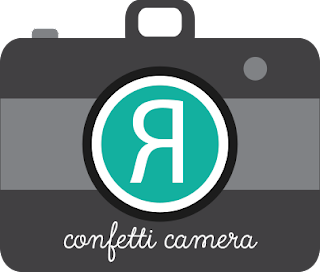 Go check out the Reverse Confetti blog for all the details about my card. 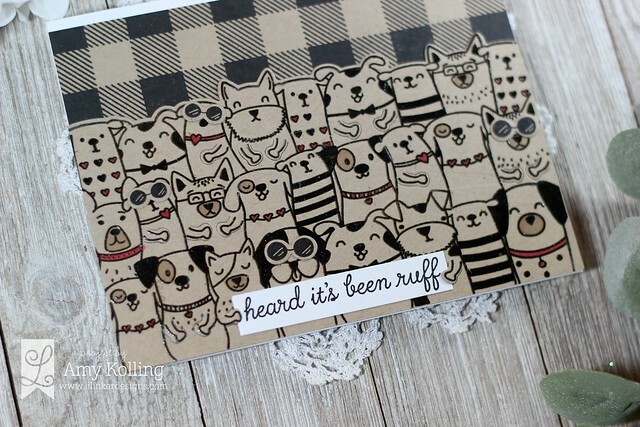 I'm here sharing a card using the newest addition to the Peek-a-Boo lineup from Avery Elle designed by my friend Heather Campbell...........Peek-a-Boo Pets! Hello! Welcome to the Hero Arts 2019 Catalog Blog Hop! There is so much inspiration and gorgeous work to be seen by the talented Hero Arts Design Team and special guests. You can shop the entire new Spring 2019 Catalog HERE!